This simple beginner’s Chakra Meditation will develop an understanding of the chakras and how they affect life. It will help to get in touch with the energy centers, the spinning vortexes of pranic energy. Chakra is a Sanskrit word which means ‘wheel’ or a ‘circle’, but in the Yogic context, it can be referred to as ‘Vortex’ or ‘Whirlpool’. Chakras are spinning vortexes of pranic energy, located at specific areas in the body, and which control the circulation of Prana permeating the entire body. On a physical level, each Chakra is associated with a major nerve plexus and an endocrine gland in the body. There are seven major chakras or the psychic centers and each relates to a corresponding specific area of the brain. In most people, these Chakras lie dormant and inactive. 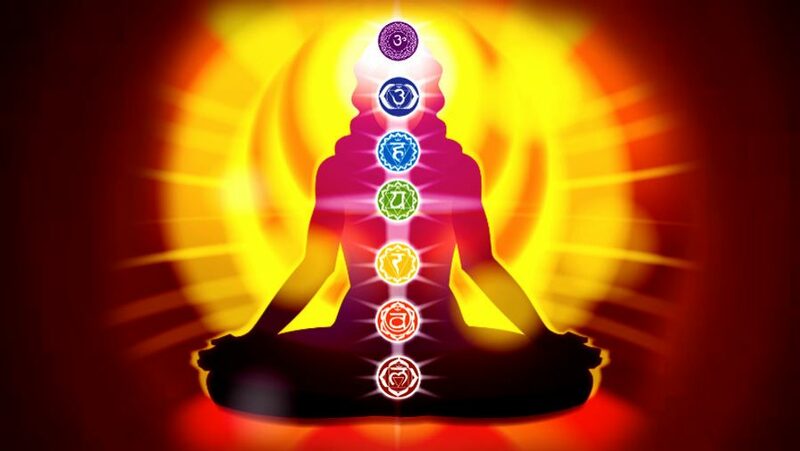 Chakra Meditation stimulates the flow of energy through the Chakras and thus activates them. This in term awakens the dormant areas of the brain and the corresponding faculties of the psychic and mental bodies. One can thus get an access to and hence experience the deeper planes of consciousness. The chakras are symbolized by lotus flowers, each having a particular number of petals and a characteristic colour. Within each Chakra is a ‘Yantra’, which comprise of the geometrical symbol of its associated element and its Bija Mantra. Within the ‘Yantra’ is a presiding deity along with the corresponding vehicle which is an animal form. The first Chakra is Muladhara Chakra, situated at the perineum in the males and at the cervix in females. Its symbol is a four-petalled deep red lotus. Next is Swadhisthana Chakra, approximately two fingers width above Mooladhara Chakra and is symbolized by a crimson lotus with six petals. Manipura Chakra, situated in the spine and behind the navel, is a ten petalled bright yellow lotus. Anahata Chakra, the next Chakra, is behind the heart in the spine and is a twelve-petalled blue lotus. Vishuddhi Chakra, behind the throat, is a sixteen petalled purple lotus. Ajna Chakra is situated behind the eyebrow center, in the midbrain. It is a silver lotus with two petals. Sahasrara Chakra which is at the crown of the head is visualized as a shining lotus of a thousand petals. There is one more chakra which is not a lotus. Its name is ‘Bindu’, which means ‘point’ or ‘dot’. Bindu is like the full moon in the night sky- big, round and golden, and is situated at the top back of the head. Each chakra has a Mantra of its own, written at the center of the flower. These mantras are primarily sounds. They are Sanskrit syllables, written in Devanagari script. Actually, there are three sounds associated with the Ajna Chakra. From left, to center, to right, they are Ham, Om, and Ksham. Bindu, in itself, is soundless. It is the creator of all sound or vibration. Sahasrara Chakra also has no sound. Spread a Yoga Mat and be seated on it in either Padmasana, Siddhasana, Vajrasana or Sukhasana, whichever pose that can be maintained easily, without discomfort, for 20 to 25 minutes. Rest the hands on the knees in either chin or jnana mudra. The head, back, and the neck should be in a straight line but there should be no strain in any part of the body. Relax the shoulders, elbows and the arms. Become aware of the Muladhara Chakra which is at the seat of the perineum. Visualize Muladhara chakra as a four-petalled dark red lotus. Shift the awareness just two fingers above the Mooladhara Chakra and visualize the Swadhisthana Chakra, a six-petalled Crimson Lotus. Visualize the Manipura Chakra, a yellow lotus with ten petals, behind the navel. Shift the awareness to Anahata Chakra, a blue lotus with twelve petals, behind the heart. Visualize Vishuddhi Chakra, a purple lotus with sixteen petals, behind the throat. Shift attention to Ajna Chakra, a gray colored lotus with two petals, behind the eyebrow center. Visualize the Bindu like a full golden moon at the top back of the head. Sahasrara Chakra is visualized as a thousand petalled bright red lotus at the crown of the head. Continue the practice and keep on visualizing each of Chakras one after the other, going from Mooladhara up to Sahasrara, and from Sahasrara back down to Mooladhara. Visualize Muladhara, a four-petalled dark red lotus; Swadhisthana, a six-petalled Crimson lotus; Manipura, a ten petalled yellow lotus; Anahata, a twelve-petalled blue lotus; Vishuddhi, a sixteen petalled purple lotus; Ajna, a two-petalled gray lotus; Bindu, like the full moon; Sahasrara, a thousand petalled bright red lotus. Remain alert maintaining the awareness of the Chakras as the visualization continues. After visualization of Chakras, shift the attention to Bija Mantras associated with each Chakra. Inside the four petals of the Muladhara lotus is written the mantra ‘Lam’. Inhale deeply and while exhaling concentrate on the Muladhara chakra and its red color, chant Laaaaammmmmm. Inside the six petals of the Swadhisthana lotus is ‘Vam’. Inhale deeply and Chant Vaaaammmm for the Swadisthan chakra while exhaling. Inside the ten yellow petals of the Manipura lotus is ‘Ram’. Chant the mantra Raaaaammmm maintaining the awareness on Manipura Chakra. Inside the twelve petals of blue Anahata Lotus is written ‘Yam’. Inside the sixteen-petalled purple Lotus of Vishuddhi is ‘Ham’. Inside the two-petalled grey Lotus Ajna are ‘Ham’, ‘Om’ and ‘Ksham’. Then comes the soundless center, Bindu, without color or Mantra. Finally comes the thousand petalled bright red lotus of Sahasrara, with no sound. For deeper meditation and benefits, the process can be followed for longer periods, under the instructions of Master. Become aware of the physical body seated on the Mat. Become aware of the surroundings. Become aware of the breath, the body, the face muscles, and its expressions. Acknowledge the peace, deep rest and other gains that have been achieved by the Meditation on Mantras. Inhale deeply, and while exhaling, chant Om. The chakras’ correct functioning result in a state of total emotional and physical well being. One gets a peaceful and quiet mind by achieving the optimum level of balance in Chakras.